A year has gone by so quickly if you’re having a great time. That’s might be what founder and curator Rain Chudori felt when preparing for a one-year celebration of Comma Books, an out of the box publisher who embraces code-switching and English in Indonesian Literature. Or what they call themselves a division under big mainstream publisher name: Kepustakaan Populer Gramedia. The called their celebration A Little Pause. Held on 8-9th December at a homey place called Kroma, Jl. Panglima Polim No. V B25, Jakarta. It was a series of launches of literature and visual arts to celebrate Comma Books’ first birthday. 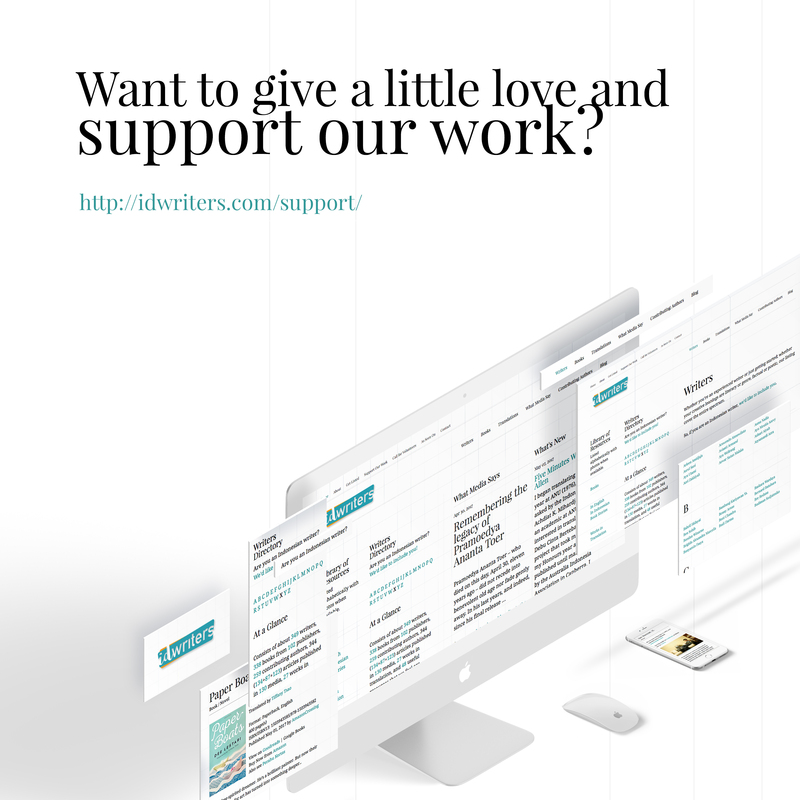 This program aims to create space for the writers of Comma Books displaying their work through workshops, reading sessions, and collaboration between writers, publishers, designers, musicians, and even readers. In the two days celebration, they also having a book launch of all of Comma Books production in the last six months, including: Kelana (Famega Syavira Putri), Pujangga series (Agung Setiawan, Edo Wallad, Farhanah, Waraney Herald Rawung) Emerging Writers series (Andre Septiawan, Muhammad Wahyudi, Pratiwi Juliani), and Blue and Other Stories (Rain Chudori). The event also displayed excerpts from the Comma Books book issued for the past year from Self Portraits series (by Chananya Rompas, Isyana Artharini, Theodora Sarah Abigail), How God Created Light (Raka Ibrahim), Imaginary City (Rain Chudori), and Monsoon Tiger (Rain Chudori). For some who joint this event in the workshop class, ‘a little pause’ was the right expression. Some of the member of Words in Motion, a workshop on writing about the movements of our emotion with Agung Setiawan, Waraney Rawung, Farhanah, and Edo Wallad, felt that this workshop made us have a moment and rethink about how we usually write, think, and even live. Taking a pause makes us able to gain awareness on where we are and what path we’re going to take. It makes us more prepared and ready to knock down all obstacles. Comma Books have only been established in 2017 and owned some bestseller books. Raka Ibrahim’s book Bagaimana Tuhan Menciptakan Cahaya was also chosen to win the national LiTRi Grand to be taken to the 2019 London Book Fair. That was quite an accomplishment in only one year. 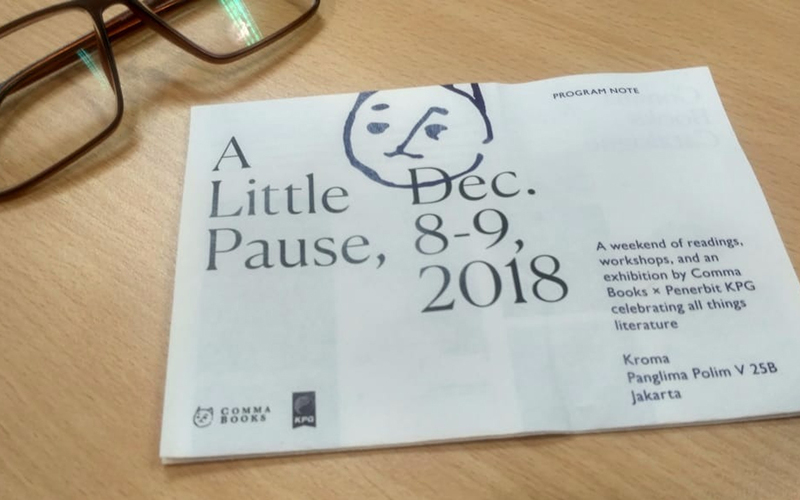 If their form of taking ‘a little pause’ is by launched nine books that they have been published in six months, can you imagine what kind of move are they going to take as their next move? We can bet it’s going to be a big one. Let’s just wait and see in 2019.